Posted in Learning Spaces, Personal Growth and Learning, School Culture, UncategorizedTagged Creativity, David Theriault, relationships, Sam Boswell, School culture, TransparencyBookmark the permalink. 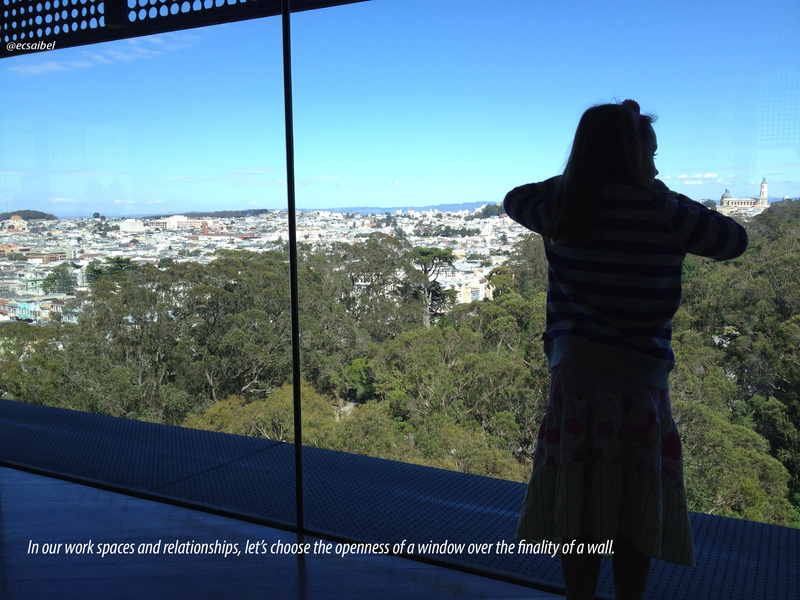 Vistas, heights, views from above offer advantages of distance to the eye/ learner-observer. What can I see here? What do I now realise? What might be possible? Yes, there’s the obvious implication of transparency, but this term suffers from moribund edu-speak. I am prompted here by Orwell’s belief that good writing is like a polished pane of glass. Clarity, then, as a metaphor for process. And – on another plane – how about soaring, uplift and backdraft as terms to unleash potentiality? Thanks for provoking a thoughtstream! I think your comment merits it’s OWN post, Sam! You have sensed something important – a window is a way to see outwards/inwards, something that can be opened (and even presumably serve as entrance/exit – why not?). That said, it is also a barrier; I may have a window into my office or classroom, which allows for viewing and (ugh) “transparency” (Orwell would be proud of your distrust of this overused, overwrought word) – however, the window still serves as a partition between viewer/viewed. A learning organization is empowered by a freer flow of information (Argyris) – windows, open doors, clarity of language, thought, process…and yet I think we still do require time alone, walled off for a spell, living an ebb-and-flow between social construction of meaning and individual reflection. Hmmmm – this “motto” for the year could easily be 10-15 variations, each imperfect in its own unique way. Cheers, Sam.